March | 2014 | misoPOW! Disclaimer: I promise this post is not going to be a ‘my point is better than your point’ rebuttal blogs from HuffPo. See the yuppie and young marriage stone throwing battles here and here then here and here. Well Japanese marketing has been getting the attention of many western foreigners these days. First, ANA, All Nippon Airlines, had the English speaking globalization commercial. 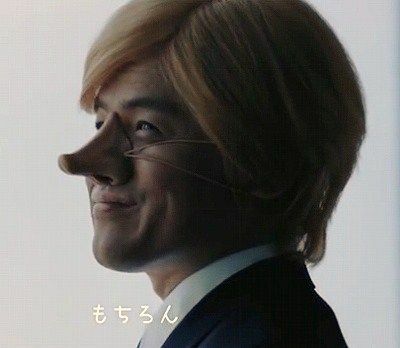 The blonde hair blue eyed Pinocchio get up worn by comedian star, Hidetomo Masuno AKA Bakarhythm, had many whites angry and equating the Japanese actor to a white actor in black face. Anyway, while ANA is doing damage control, Coco Juku, one of the major eikaiwas in Japan, has caused a bit of an eyebrow raise with some of The Japan Times’ readers. In response to an article by, Michael Hoffman, one reader, Jun Shiomitsu, added his two cents to the pot. Shiomitsu’s tie in to Hoffman’s article is a bit unclear, but I’m assuming his Angry for Coco Puffs piece was an reverse sucker punch to the face of all the Japanese-loving foreigners, Hoffman talked about. If that’s the case, Shiomitsu unveiled Japan has somewhat of a chauvinistic approach to globalization. ANA’s CM may be the loudest approach but Coco’s little train ad reaches its bemoaning audiences in a hush manner. Shiomitsu is concerned at how the ad of a Japanese man seeking a global and better woman is degrading to Japanese and Western (well…white) women. I had to respectfully chuckle at this one. If Shiomitsu only knew of the relentless amount of bashing Japanese men have gotten when it comes to foreign women and Japanese women combined. Foreign women complaining about having to be the one to make the first move or about even being satisfied romantically– and I said romantically, not sexually. There are even books listing why foreign men are more desirable than Japanese men. Now, I don’t apply this to every Japanese women however the general consensus amongst foreigners living in Japan seems to be that Japanese female and foreign male relationships are more frequent than Japanese male and foreign women. But to be fair, viewing a foreign woman as a BMW while chucking out the red stage Nissan of a Japanese woman to the curb, seems more of smack against Japanese women than it does against a western one. Hence, absence of a Japanese woman in Coco’s ad. Ouch! No wonder why foreign men and Japanese women hook up more often. Putting the “lesser Japanese woman” aside for a sec, is it really degrading to feel like a trophy? If society paints a less than stellar looking 1% card holder as trophies for gold diggers, is it a smack to the face if such a person is content? Happy? Satisfied? On the flip side, is it insulting if the western bride is content herself? 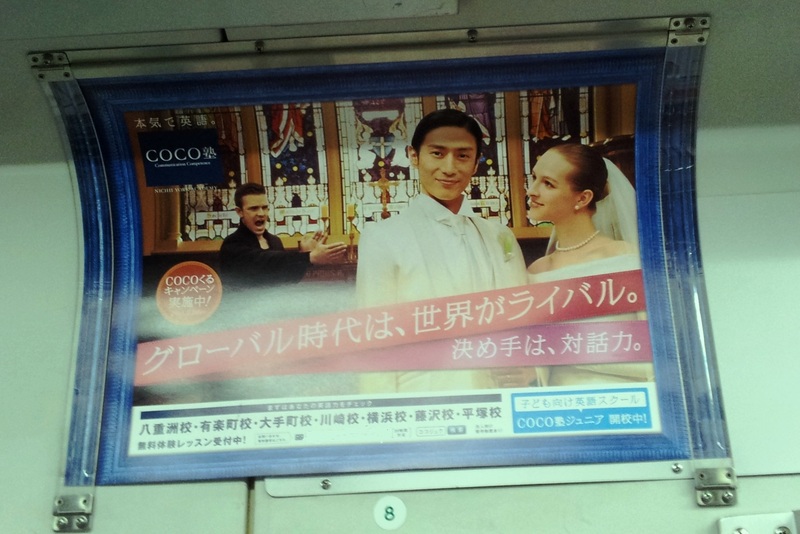 In the purpose of this ad, the English-speaking Japanese hotshot can at least look international with his trophy bride. That seems like a modest reason to want to be with a western person. Key qualifier: if both parties are content. 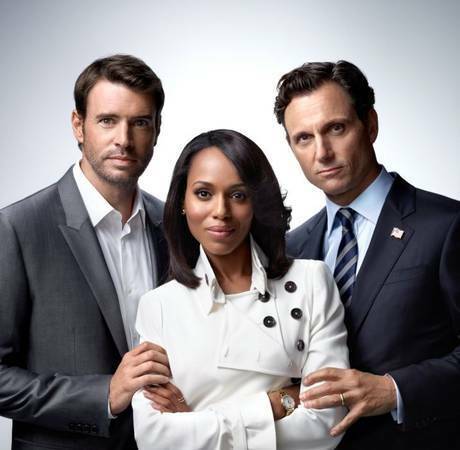 I don’t know about you, but every Thursday at 9:00pm I have no problems with watching two white men make one black successful woman feel like one hell of a trophy. I’m pretty content with those images. Thanks Shonda! Of course people want to be cherished for their personalities over their demographics, sure, doesn’t everyone? Getting real for a bit though: Society is painted as a Gucci bag of some pretty shallow people. Maybe it’s my western mind but the majority of advertising seems to make a women with very few beauty flaws the ultimate trophy, for men and women alike. In the end, it would have been nice if there was more written by Shiomitsu on this. There isn’t really much to go on from an flimsy ad but perhaps he’s witnessed such complaints of the human trophies. The scope is pretty thin here…NEXT. Now ANA’s global ad that everyone’s been up in arms about is something I guess some westerners could feel insulted by. But blonde hair and blue eyes with a protruding nose is the ideal western look to many Japanese. No matter the height, width, or intellect, many some Japanese get star struck on those two features alone, so I really don’t get the uproar. It seems a far cry from Japan’s horrendous Sanbo blackface days. Pretty high chances it’s because no Japanese person really wanted to be black back then. Where is this anger coming from when white beauty and attractiveness is seen as a validation? Even companies in China hire white business models to walk around their offices to convince others their company has global legitimacy spewing from any and all known orifice. With all the ego boosting ads around, perhaps having a nose rocket is more of an insult than being a shiny trophy. What’s more head scratching is somewhere in Tokyo, Japanese Donald Draper thought the slogan 「グローバル時代は世界がライバル。」　AKA ‘In the global era, the world is your rival’ for a Japanese-Western wedding was a good idea. I’d get that if it were a typical Japanese business person pictured with other global businesses trying to work a deal; applying it to love seems kinda dickish. And this bride?! I’m not sure if this is Japan’s interpretation of a submissive foreign woman or if she really wants his goods. 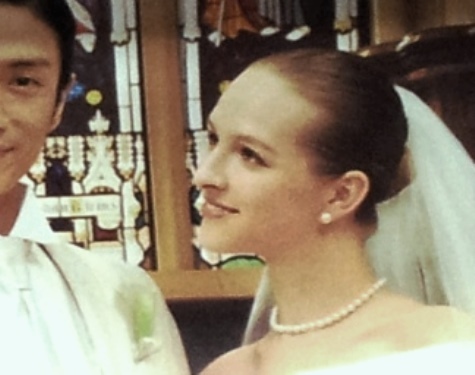 The models on a Japanese bridal ad typically have the wedding bliss face down to a fault. This face is a shrewd, ‘Oh, we got him good’ face. At the end of it all, just as Shiomitsu alluded to, this ad seems to speak more to the Japanese men with an inferiority complex. This ad isn’t for those who are excited about becoming a global nation, this is for Japanese who are stuck in companies with managers bugging them for a TOIEC score of 650 or more. Believe me when I say I’ve taught some of these students. Salarymen who are bothered by the fact that their job or good graces with the boss is in jeopardy because of globalization. This doesn’t refer to the majority of them but definitely a few. Can’t really shame them for it. Could you imagine the Americans who would have a meltdown if their companies passively encouraged them to learn Spanish? I’d say these disgruntled Japanese have handled these global changes a lot better than say Americans watching a Super Bowl Coke commercial. Well, there was the Meiji Restoration, you know that whole thing were Japan nearly imploded on itself over whether or not to open the country to the rest of the world. Maybe there is a Republic Restoration in America’s near future. Coco Juku would have access to plenty of disgruntled American’s forced to learn Spanish. I caught Coco塾’s new 30-second spot of the Mr Success Wedding ad while watching ‘Masaka Hanashi.’ I..just..can’t.